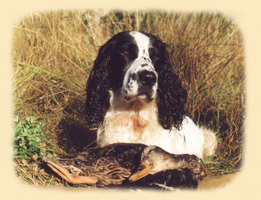 The Russian Spaniel is the youngest breed among Russian gun dogs. It is a part of the larger group of spaniel breeds, and originated mostly from English cocker spaniels and English Springer spaniels. The history of spaniels in Russia begins at the end of the nineteenth century, when a black English cocker spaniel, named Dash, was brought to Russia for the great knyaz Nikolai Nikolaevich, and was shown at the 1st Dog Show of the Neva Huntclub in 1885, and at the 1st Show of the "Lovers of Purebred Dogs Organization" in 1888 in St. Petersburg. Later, more spaniels of this and other breeds were imported into St. Petersburg and Moscow. Even though some of them were used for hunting, these rather small stocky dogs had very little use in Russian bird hunting conditions. At the beginning of the 20th century, lovers of spaniels started selecting more long-legged and active dogs for breeding. They were also importing Springer spaniels to mix their blood with that of the existing "mixed spaniel" breed. In 1951, the first Standard of Russian Spaniel, meeting the requirements and inquiries of hunters of the Soviet Union, was developed and established. After institution of the “overall show grade” for Russian Spaniels in 1951, a selection of individual dogs with the best external and field qualities began to improve the breed stock. Somewhat modified, the standard of the breed was accepted into use in 1966. Starting in 1972, the Russian Spaniels were no longer crossbred with other spaniel breeds. Large kynological centers have been working on improving the breed. Ever since, the selection of specimens and pairing is done based on the results of the annual shows and field trials, considering all positive and negative qualities. Use of only those dogs with proven hunting abilities allows to avoid the division of the breeding stock into show and working dogs. As the result, the dogs are both beautiful and with the hunting instincts. Today, special attention is paid to stabilizing the height and hair coat heredity, selecting pairs based on the pedigree, hunting and exterior qualities. As a result of this purposeful breeding, Russian Spaniel of today is a dog well equipped for the hunt in a marsh, field, woodland, aridland for bird and waterfowl in conditions of the Russian territories and neighboring countries. 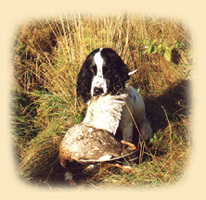 The goal of a Russian Spaniel during the hunt is to seek out the bird, flush it up into the air, and after the shot and on command to retrieve the game. Field trials on blood trails also proved their usefulness in search of rabbits, some types of hoofed game, etc. The Russian Spaniel has all the field qualities necessary for a gun dog: stamina, great sense of smell, energy during the search, persistence, and inborn willingness to retrieve. These dogs start to work early in life and do not require a lot of training. All of the above qualities resulted in the popularity raise of Russian Spaniels, and consequently, the increase of their numbers. Moscow dog shows of the last 20 years annually include 120 to 131 Russian Spaniels, in numbers shown sharing the first place only with the Irish Setters. In addition to the traditional centers of Moscow and St. Petersburg, new kynological centers were created in Kirov, Saratov, Tambov, Ryazan, Cherepovets, demonstrating an even more increasing popularity of the Russian Spaniels all across Russia. Owners of Russian Spaniels are as loyal to their dogs as dogs are loyal to them. So when some of them immigrated to the United States or Canada, their canine friends came along. Some immigrants, remembering these wonderful dogs, purchased puppies from Russia and had them flown in. Many times a Russian Spaniel owners had to answer curious passerby’s questions about the beautiful dog, walking along at the park or on the street, since the breed is completely unfamiliar to most Americans and Canadians. The AKC and UKC do not recognize the breed, and most books do not even mention it. Unfortunately, it is unknown how many Russian Spaniels crossed the ocean, and all of them are scattered throughout the enormous territories of the United States and Canada. In 2002, a couple of Russian Spaniel owners got together and established the first registration website for Russian Spaniels in the USA and Canada. As more and more people learn about this wonderful breed, puppies are being imported from Russia. Owners of older dogs are learning about and joining the Russian Spaniel Club. Very soon Russian Spaniels will take their rightful place among popular breeds on the North American continent. Compiled and translated from Russian by A. Schroeder and E. Kaplan. Thanks to http://www.spanieli.ru for providing pictures.